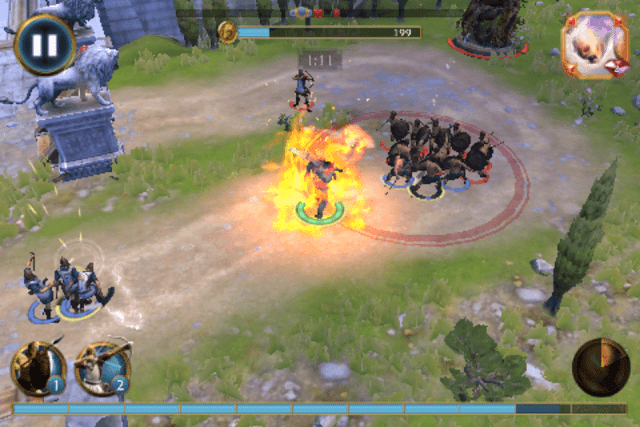 Olympus Rising is a stunning Greek mythology-themed action RPG from Flaregames. It lets you build your island, recruit units and unleash famous Greek gods and heroes to conquer opponent’s islands for gold and ambrosia. You will have to deploy your best units to destroy towers, defeat units and demolish your opponent island’s gate for loot and treasure chests. To get more loot from a conquered island, you will have to reach the gates and destroy them before the timer runs out. The olive wreaths and the associated keys you receive depend on the several factors, such as the number of units and towers you have destroyed and the time you have taken to reach the enemy’s gate. You get a guaranteed olive wreath when you destroy your enemy’s gate. You will have be pretty quick in destroying all towers and accessing the gate to gain all three wreaths, and the best way to destroy an island faster is to use a hero’s special powers decisively. Special powers can have devastating effects on towers and groups of enemies. However, a special power invoked by a player follows the hero and strikes wherever the hero is present on the map. Tap a tower and your hero will attack it. Next, quickly tap a special power icon at the bottom-right corner of the game screen to activate it. The special power will be launched in that area. Because such powers do more damage, they will be a big help in destroying towers faster. You can also launch special powers at the gates, just make sure your hero is nearby and is attacking the gate. Invoking special powers at the gates will help you destroy them quickly before the timer runs out. The more units you have deployed on an enemy’s island, the better they will be at dealing with large numbers of enemy units. When your units are fighting enemy units, keep an eye on your unit buttons at the bottom-left corner of the screen. When the button is active, tap it to call your units. The current lot will keep fighting and more units will arrive as reinforcements, making your army much stronger. Deploying more and more melee and long-range units will be of great help to your hero, who can then focus on targeting towers and stronger foes. Archers can go along pretty well with melee units and shoot a bunch of flaming arrows from a distance that can pretty much kill most enemy melee units. But beware; your opponent will deploy archers so make sure you have deployed several spearmen and other melee units to take care of long range units. You can get heroes from “Heroes’ Temple”. Collect more heroes and place them on conquered islands to guard them. With a hero on guard, a random enemy will have a tough time conquering your island. Tap on a conquered island that produces better resources. You may choose an island that produces more Ambrosia or coins than the other island. 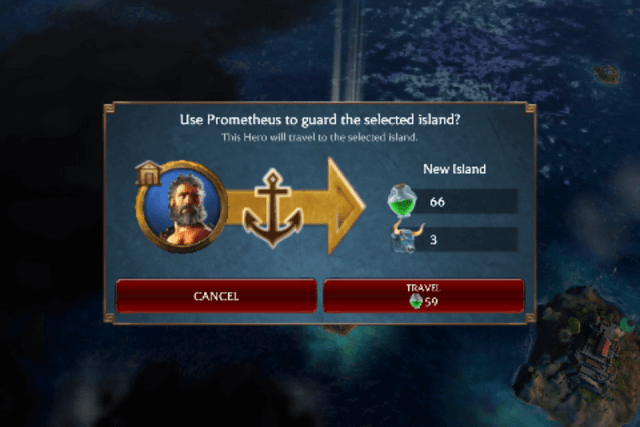 When you tap an island, you will notice two icons – Ship and Anchor. Tap the Anchor icon and select a hero to guard that island. You will need to spend some ambrosia before sending him to guard your island. Make sure you choose stronger heroes. Equip items to your heroes to make them powerful. “Dominance” is denoted by a Cretan Bull icon. It is used to unlock heroes at the Heroes’ Temple and discover island groups. When you conquer an island, you will receive some Dominance as “Hall of Fame” rewards. After conquering the island, you will receive additional dominance every now and then. Keep an eye on “Production with Hero” resource stats when you tap an enemy’s island. It shows what the island will produce after you have conquered it and placed a hero to guard it. Most islands will produce a maximum of 2 dominance, but there are hard-to-beat islands that can produce 4-5 dominance. You can also earn dominance by completing quests. On the world map, you can see several islands. Zoom in to these islands a bit and tap an island. Tapping it will display key information about an island, including the loot that you will receive after raiding it (shown to your left) and the items it will produce with your hero on guard (shown to your right). Start raiding islands that produce Ambrosia. Look for islands with Ambrosia bottle icons above them and start attacking them. Upgrade this building to increase production per hour and capacity. But before that, you will need to build and upgrade the Heroes Temple. Don’t forget to upgrade the Ambrosia Silo if you want to store more of this sacred liquid. Storing more ambrosia will allow you to attack frequently and revive your heroes in battle. Keep completing quests to collect rewards, which includes gold and ambrosia. You can see your current quests by tapping the top portion of the screen. Tap the quest bar to see a list of new missions available and complete them one by one to get rewards. You will have to tap the top portion of the screen again to claim your rewards. Keep playing the game every day to unlock Daily chests which may contain ambrosia. Leveling up War Academy will unlock new units. Besides common units, you can unlock special units such as trebuchet and siren. You can also unlock solo but powerful units like Minotaur, Cyclops and Hydra, but for that you will have to conquer a group of islands. You can get more information about each unit by double tapping the war academy. Upgrading Heroes’ Temple will unlock upgrades for other buildings, such as gold and ambrosia temple. However, you will need to reach a certain “Ascension Level” before you can level up this building. To reach a new Ascension level, you will need to attract “Worshippers”. To attract worshippers, keep constructing new buildings and upgrading existing buildings. Exploring a new set of islands also grants more worshippers. Upgrade Gold temple to get more gold donation. Leveling up this building will increase the income per hour and capacity. You will also receive worshipers after upgrading it. Along with leveling up this building, try to upgrade the Chamber of gold to store more yellow metal. The Guard of Thanatos lets you deploy defensive waves of units. The wave of units will protect your island and prevent intruders from destroying your gate. Upgrading this building will let you recruit more defensive waves. The upgrade will also allow the building to deploy waves of units faster. The time taken between two waves will be lesser than before. Before upgrading slots to add more units, you will need to upgrade this building. Leveling up the Shrine of Power will let you unlock more devastating special powers, which you can launch while attacking enemy island’s towers and the gate. Upgrading this building also raises the level cap of each unlocked power. To make your unlocked powers more powerful, you will need to level them up, but for that you will have to upgrade this building first. After upgrading your gate, make sure you extend your path to make it harder for intruders to reach the gates. Press your path and then drag to make a U shaped road from it. You can design your own path, but do remember that there is a limit to path designing and you will have to keep upgrading you gate if you want to draw a longer path for intruders. Max out tower construction and make sure you build one tower on each path extension. Build a barricade in front of each tower to slow down enemies. Your enemy units will first have to destroy the barricades to move further. Your barricades will keep them busy and towers will take them out one by one. To get more barricades, upgrade the Heroes’ Temple. To get more common towers you will have to upgrade your gate to a certain level. To unlock powerful towers, you will have to reach a particular Ascension level. Pay attention to other player’s defense and path design. You can see a tiny snippet of your enemy’s map before attacking their island. You can take inspiration from their maps and build defenses accordingly. Build and upgrade the Guard of Thanatos to deploy more defensive units against intruders. Upgrading this building will decrease the time taken between each defensive wave, which means the second wave of units will arrive faster than before and so on. Upgrading this building will unlock additional waves, just don’t forget to unlock slots in each wave to ensure more and more defensive units keep arriving and destroying enemy intruders. Your hero plays a very important role in battle. Use him to destroy towers, large groups of enemies and gates faster. Equipping your hero with stronger gloves, armor and weapon will increase his ATK, Health, Speed and other key stats. Before invading an island, tap Equip to see what items (which you have collected so far) can be equipped to your hero. You can get equipabble items from loot chests that you receive at the end of the battle. Keep destroying towers, eliminating enemies and finally destroy the enemy gate before the timer runs out to get keys. Use the keys to open battle chests and you might get a free common, uncommon rare or epic item. You can also get chests via “Daily Gifts”. Play the game every day to unlock such chests. They contain 4 random items and may grant some rare gear. You can also buy chests by tapping the big chest icon on your home screen. Go to Item Shop and purchase a Blessed or Epic Item chest with coins. You will have to earn plenty of coins before using them to purchase them.